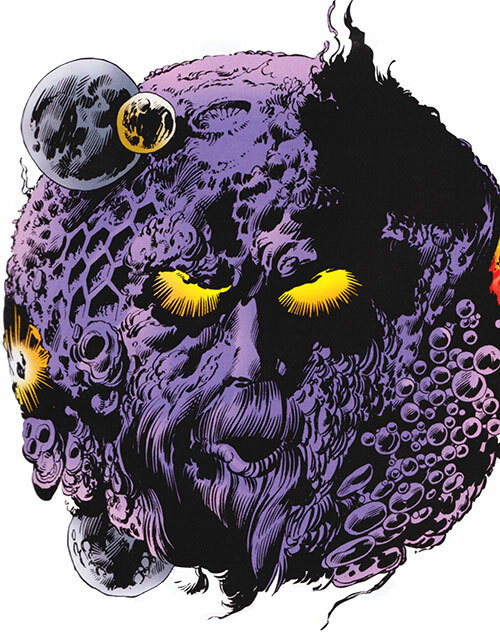 Ego the Living Planet is a classic Marvel Comics entity, who first appeared in 1966. The name and pictures say it all, I think. This is an older profile, since “I wonder what stats Ego would have…” is a natural question in any super-hero RPG system, at least for us. Known Relatives: Ego-Prime (clonal scion). Diameter: 4165 miles. Weight: Unrevealed. Ego is a ’living planet‘ with total control over its entire mass down to the molecular level. It may use its own substances to extrude tentacles, organic sensors, and plantlike growth and to create humanoid vessels for its consciousness. It can shape its surface into the appearance of a gigantic face, or to appear as a dead inhospitable planet or as an idyllic paradise to lure space travelers to its surface, which it then absorbs. It actually possesses various internal features such as gigantic tunnels (comparable to arteries) and a gigantic brain looking like a huge insect egg sack. It also has a digestive system and an antibody system. Ego’s massive brain and structure enable it to absorb life and star energies as in photosynthesis. It is also a very powerful telepath enabling it to communicate over interstellar distances and even combat telepathically as well as move objects telekinetically. Ego’s mental defenses are humongous and physically it is near impossible to destroy, although pushing it into a sun will do that. Ego’s weaknesses are his lust for vengeance on those who have defeated it and the sidereal propulsion unit that it almost cannot control, but that others can use to send it flying warp speed in any direction. The living planet Ego was born (i.e. gained consciousness) in the Black Galaxy. It has claimed the status of an Elder of the Universe, but did not qualify since he’s not a sole survivor of an alien race dedicated to a single pursuit. Ego first appeared while planning for interstellar conquest. It had to battle Thor and the Recorder and had to renounce its plans. Later it went insane and battled Thor, Firelord, Hercules and Galactus. 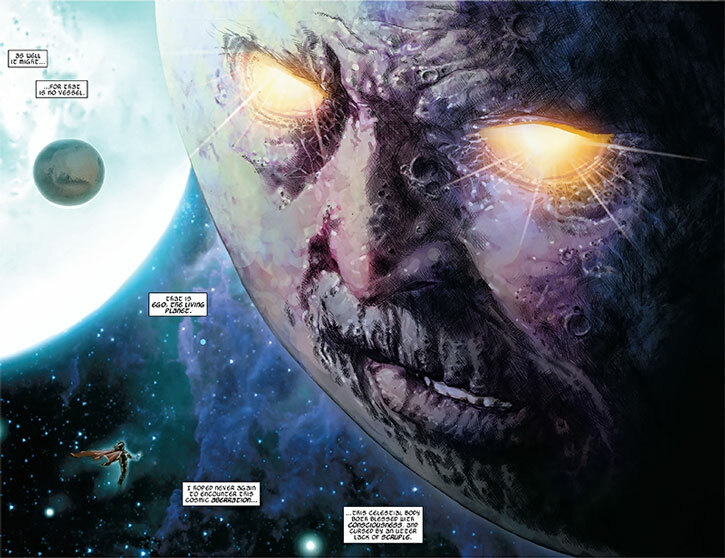 Ego was defeated as Galactus attached a sidereal propulsion unit on its surface and sent it flying away from populated space. 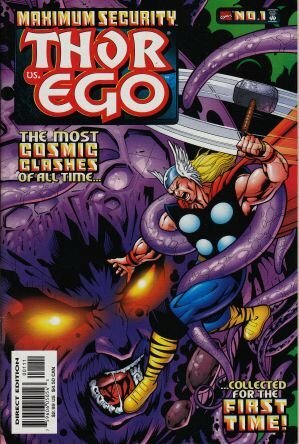 Later Ego returned to Earth for seeking vengeance on Galactus. But his propulsion unit was sabotaged by the Fantastic Four and his substance was broken apart by the sun itself. Later still Ego managed to reform itself and to repair the propulsion unit. In this process it also absorbed many Dire Wraiths to replenish its energy reserves. He fought Rom, the space knight, around that time too. 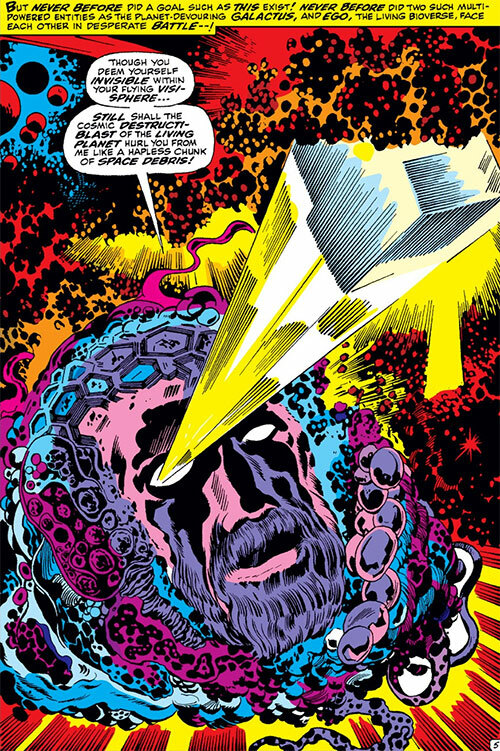 Later still, Ego joined the Elders of the Universe in an attempt to destroy Galactus, but had to battle the Silver Surfer and lost. He returned later still to kill the Silver Surfer who again managed to defeat it by use of the propulsion unit. After that Ego remains again at large to satisfy its hunger for energies. Ego is a planet. It actually is a big, living, thinking planet. Controlling its entire planetary surface he can look just like anything, but usually prefers the look of an old man’s face (or rather a head) complete with mouth, nose, two yellow glowing eyes, a mustache and a large beard (which reaches beyond the planetary surface like a titanic mountain). Its ’skin’ is the landscape of the planet which mostly consists of grey-red mountains, volcanoes etc. As bait, it might look healthy, green and a fine planet for potential victims/nutrition. When talking to a character in space, looking down at it, it moves its miles long lips and even blinks. There are several sorts of vegetation as well as different weather on the planet, all of which Ego controls fully. The full appearance of a living planet is really indescribable and most humans are shocked upon seeing it in space and realizing that. All in all it is slightly smaller than the entire Earth. Ego’s intellect is inhuman and it possesses a unique sort of personality. Its will, much like that of Galactus, is entirely focused upon the task of survival. Ego roams the universe in search of new food in the form of starlight or humanoids. Its long life has taught it patience and it is quite a strategist. Ego apparently also feels that interstellar conquest is the way for it. Basically, Ego does anything to survive and would kill any being or planetary system in the name of survival. In this it is as uncontrollable as a primal force. It often lures humanoid beings onto its planetary surface, disguised as a green, healthy planet, and then absorbs their life energies. In speech it appears old and sometimes very slow, although it will scream in panic when lethally threatened. Uhoh, Ego is extremely powerful…it’s an entire planet for God’s sake! It’s mostly usable as a nihilist planet so throw it in as a powerful ally with other cosmic beings or as an adversary to space traveling player characters ; of course such character either have to be very clever (and using the propulsion unit) or near-gods to survive the encounter. Over in the DCU, Ego would be a recurring Adam Strange opponent, bent on replacing Rann’s prime location. Each time, Ego has been defeated by the Earth man’s cunning (and the occasional biotechnological wonder virus from Rann’s top scientists). At least twice, though, Ego’s attack was so direct and brutal that Strange needed to call in the assistance of the Justice League of America. In the DCU, Ego might actually be the evil brother and archenemy of Mogo the Green Lantern. The propulsion unit would then have been placed on Ego by the Guardians, the Monitor or even Mr. Nebula. 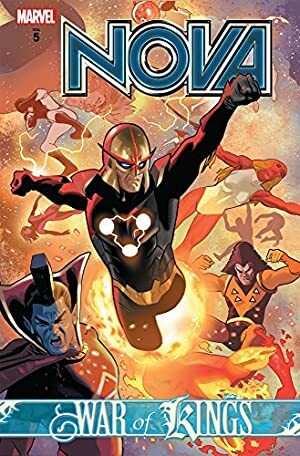 In the future, Ego, being nearly immortal, will come into contact with the Legion of Super-Heroes. Perhaps he could apply for membership in the United Planets as part of a ploy. Mind Blast has a maximum Range of 35 APs (+3). Earth Control, Weather Control, Plant Control and Vampirism all have their Ranges increased by +20 APs (+4). Earth Control, Plant Control, Vampirism and Weather Control are usable only on Ego’s own surface (-1). Growth and Density Increase powers are Always On and are already factored in (-1). Mind Blast has a Minimum Range of 20 APs (-1). Vampirism has a Range of Touch Only (-1) . Flight is a Minor Marginal Power (-1 – it is his supposed mode of movement, but he never uses it on-panel). Area Knowledge (Black Galaxy), Life Support (No Need to Breath), Scholar (Astronavigation, Alien Races and Celestial Beings). Elders of the Universe (Low). Minor Rage, SPR (No manipulatory appendages), Oblivious, MIA (seeking vengeance on those who have defeated it), CIF of his impending destruction, Strange Appearance. PROPULSION UNIT [/DEX/ 02, BODY 10, Flight: 45, R#2, Hardened Defenses]. 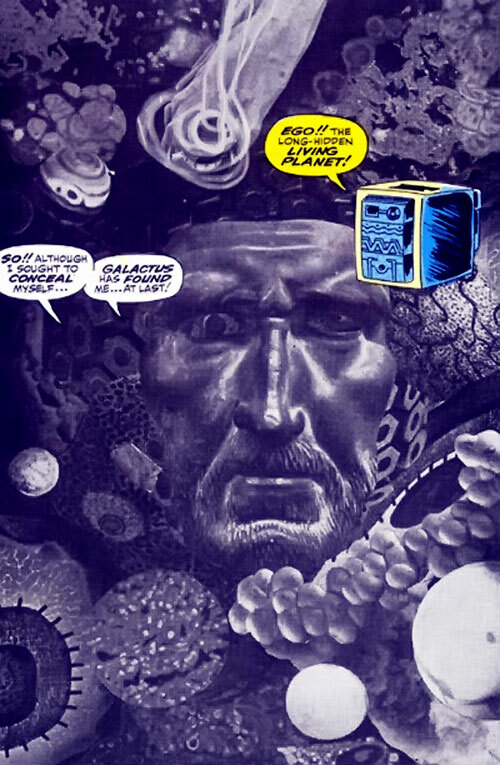 Galactus attached a propulsion unit onto Ego as punishment – to give him a weakness. Ego cannot personally control the Sidereal Propulsion Unit unless the unit is turned off and he succeeds in rolling a 18 or more ; success means he can start the propulsion unit and steer through space as needed, giving him some maneuverability. However, if somebody else has started the propulsion unit, Ego no longer has any possibilities of manipulating the unit until it is turned off again. Any character that finds and understands the unit may choose to use it against Ego with no chance of interference from Ego. Such a user can turn the engine on, steer Ego’s flight through space or turn the engine off. He can, of course, also choose to leave it on, steer Ego towards a particular destination, and then leave it, giving Ego no choice but to go there (Ego’s own Flight abilities are not strong enough to give him back control of this unwanted flight path). Ramming an inanimate object uses Ego’s STR/STR vs the target’s BODY/BODY and damage is given as per the Charging Rules. Source of Character: FF, Silver Surfer Comics etc, Marvel . Helper(s): John Colagioia, Jay Myers, Phil Dixon, Sébastien Andrivet, Daniel Ream, William Chamberlin, Jackson.